These are exciting times in additive manufacturing (AM) – the process of building objects by 3D printing – as the industry moves from prototyping and design towards production at scale. 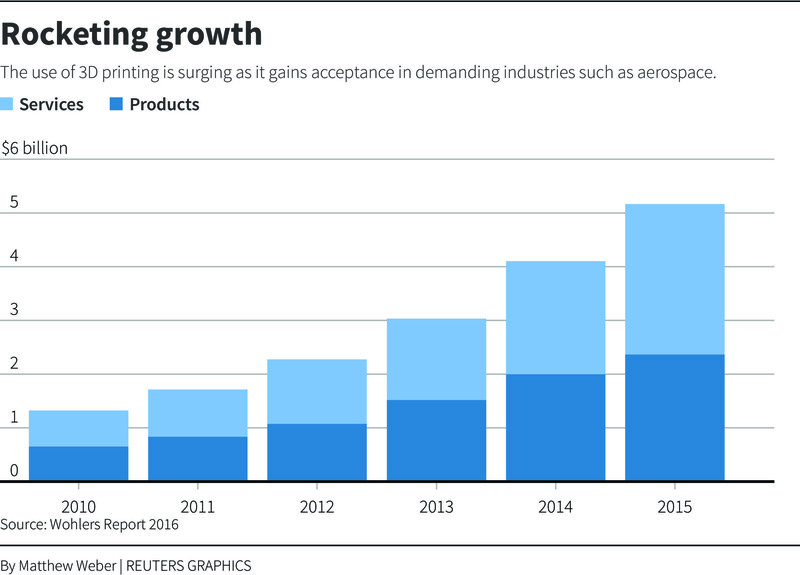 This evolution is not a surprise: the industry is delivering on its initial promise of scalable additive manufacturing. But the transition will not be business as usual. We expect four major shifts that will change the way the industry is organized. As the industry gathers momentum, it is presented with a huge opportunity to make AM sustainable from day one. AM as a production process is intrinsically sustainable, primarily due to a more rational use of materials, with reduced scrap and waste. Other environmental benefits comprise a reduction in the ecological footprint of transportation by enabling distributed and digital manufacturing – not just for small, highly customized production runs, but also for mass-volume production, as in the case of Volkswagen. In medical applications, surgery time can be reduced by up to 30% by enabling doctors to practise complex procedures (such as cardiovascular operations) on lifelike 3D-printed surgical models. But sustainability means much more than this. Today, only a small fraction of the materials used in additive manufacturing are sustainable. If we passively accept this situation when we scale up to full production, we will be amplifying the challenges facing us today. We have a historic window of opportunity to fundamentally rewrite the rules for the industry, by hard-coding sustainability into additive manufacturing. We can do that by looking for ways to design recyclable and/or reusable materials and products, and by going full throttle (or almost) on bio-based resources. Trying to sidestep the trend towards sustainability, as a defense mechanism, is not an option for DSM. In fact, we are actively using the UN Sustainable Development Goals as guidelines for our business strategy. They help us to ask questions on how we can develop materials that respect health and well-being (SDG 3), limit the impact on climate by reducing emissions (SDG 13) and allow us to produce and consume in a more responsible way (SDG 12). If we end up on the wrong side of history on this issue, consumers can and will hold us accountable. If we want to become a powerful industry, we need to address this responsibility right now. In the world of prototyping, the focus is on design and visual aspects, less on materials. Once we start to produce end-use parts, the parts themselves – the applications – will come under scrutiny. Whether they be medical and dental models and prostheses, sportswear items (such as trainer insoles), car parts or electronic components, they all have specific requirements in terms of performance, regulations, safety and quality. They have to be very forgiving, able to survive in extremely hot, cold, wet or dry conditions. At the same time they have to maintain tolerances over thousands, or tens of thousands, of cycles of use. Whatever the requirements, they are non-negotiable for manufacturers, regulators and consumers. A focus on product life cycle intrinsically implies an even stronger focus on materials. The age of the application in additive manufacturing is in fact the age of materials. To get to the point where manufacturers and OEMs are ready to adopt 3D printing as a practical manufacturing technology, it will be up to the AM industry to create trust across the board. Stakes are already higher than ever before in terms of information. Manufacturers require iron-clad guarantees not only of the printing equipment and materials, but also of processes and software. The entire value network will have to mirror the customer’s specifications, certifications and regulations. We can see how visionary printer manufacturers are turning their attention to materials, and the way in which materials technology interacts with their processes. End users of industrial 3D printing will expect answers regarding printers, materials and software processes from printer manufacturers. At DSM, we consistently certify materials, processes and printers, working in close cooperation with printer manufacturers, service bureaus, software providers, and end users/OEMs. As collaboration and integration in value networks become ways of “jumping the queue” in purchasing decisions, the way we do business in the industry will shift from walled gardens to ecosystems. It would be a mistake to turn to the 2D (laser and ink) printing industry for an idea of how additive manufacturing will evolve. In ink and laser printing, when you choose a printer, you are also choosing your toner supplier. This printer-centric model prevailed in the prototyping and design era of additive manufacturing, because the materials were to a large degree comparable to the ink in a printer: their purpose was visual, not functional. As 3D printing moves into real manufacturing, this will no longer be the case. Companies will be forced to provide materials that fit applications and meet specifications. What’s more, single sourcing is not common practice and not without risk in a production environment. We have to accept that material companies cannot do this on their own. They need to work together with printer companies, software, technology and end users to find the best fit for applications. If everybody in the value chain works together, we can create an ecosystem that will offer benefits to all players. At DSM, we are open to collaboration with an extensive stakeholder platform in order to accelerate the adoption of AM in mainstream manufacturing. Because we are not there yet. Today, less than 1% of the materials available for injection molding can be used for 3D printing. The transition from prototyping to manufacturing requires different business models. Enabling the digitalization of manufacturing requires open networks where all players involved can add value and gain profit. Accelerating adoption requires several moving parts to work together, such as design, printers, software and materials. Working in isolation will slow the process and not allow full benefits. Collaboration is key. In the business environment, this means sharing margins and value. Every player will receive a fair share, while every application may require a different set of players. In the digital world that would mean “pay on demand” by services or products, similar to a blockchain environment where every player will have secure technology and be able to contribute value as well as receive a share of the profit. As additive manufacturing moves into industrial production, the industry will experience disruption similar to what has been happening in other industries, such as TV on demand, LED lighting and mobile apps – and many others to come.